For all sorts of reasons ranging from artistic to economic, producing cinematic art of the first rank is necessarily rare. 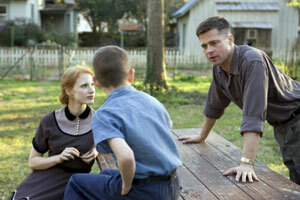 Writer/director Terrence Malick has defied the odds and created a masterpiece of harrowing truth and deeply felt emotion. Brad Pitt (Mr. O’Brien) is like never before. If the acting career does stop here, he’s achieved far more than many who already have or will remain on the screen for decades to come. Hunter McCracken is a real find playing young Jack as he learns more about life than he could ever imagine once unleashed from his tyrannical dad’s constant grasp. Alexandre Desplat’s score is a model of function supporting form, but it’s the classical tracks from Mahler and Brahms that steal away the ear even as O’Brien’s lost art haunts him all the way to a meaningless job. Here, the literal father of invention fails to hawk a single patent even as he scours the globe for takers. Everything is beautifully captured by cinematographer Emmanuel Lubezki’s unerring eye and artfully woven together by a quintet of editors. The convincing look and feel of then (Waco Texas in the ‘50s), now and the distant—one can only hope—future has been marvellously rendered thanks to production designer Jack Fisk’s sensitivity to tone and detail.